Sis-in-law Sharoan texts to ask for our easy Tuscan white bean recipe, so for her and for all, here's our easiest: a quick-cooking, dryer cousin to the famous pasta e fagiole soup of Italy. Drain beans and pour them into a large saucepan. Add onion, carrot, celery & bay leaf. Add water to cover by 2 inches. Bring beans to a simmer. Don't boil them or salt them yet; this leads to toughened and loosened skins. Simmer gently until beans are tender. Start checking at 30 mins. When beans are tender, drain and remove vegetables & bay leaf and herb stalks. While beans are simmering, in your second suacepan, heat 2 tbs of olive oil. Add tomatoes and sautee until the sauce starts to thicken and turn and golden orange. Add the garlic and continue to cook on low heat for about 10 minutes. Season with salt and pepper. Make your pasta in well-salted water. Drain. Now, add pasta until you have your desired ratio of beans to pasta. Taste and season with salt in pepper to taste. Serve in big bowls, dressed with your best olive oil. 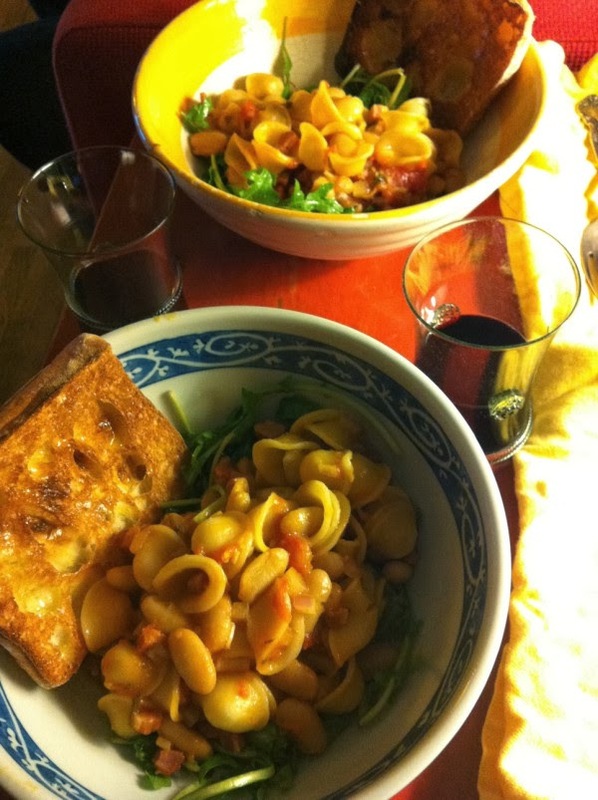 Pictured here: the beans and pasta served on fresh greens with garlic toasts.